The subject of real analysis is concerned with studying the behavior and properties of functions, sequences, and sets on the real number line, which we denote as the mathematically familiar R. Concepts that we wish to examine through real analysis include properties like Limits, Continuity, Derivatives (rates of change), and Integration (amount of change over time). Many of these ideas are, on a conceptual or practical level, dealt with at lower levels of mathematics, including a regular First-Year Calculus course, and so, to the uninitiated reader, the subject of Real Analysis may seem rather senseless and trivial. However, Real Analysis is at a depth, complexity, and arguably beauty, that it is because under the surface of everyday mathematics, there is an assurance of correctness, that we call rigor, that permeates the whole of mathematics. Thus, Real Analysis can, to some degree, be viewed as a development of a rigorous, well-proven framework to support the intuitive ideas that we frequently take for granted. 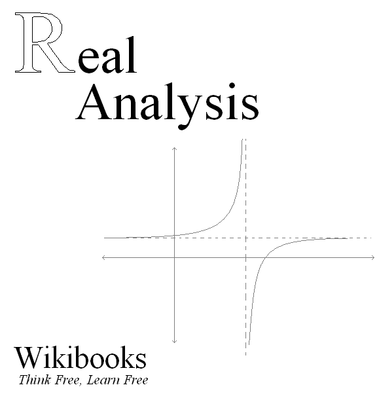 Real Analysis is a very straightforward subject, in that it is simply a nearly linear development of mathematical ideas you have come across throughout your story of mathematics. However, instead of relying on sometimes uncertain intuition (which we have all felt when we were solving a problem we did not understand), we will anchor it to a rigorous set of mathematical theorems. Throughout this book, we will begin to see that we do not need intuition to understand mathematics - we need a manual. The overarching thesis of this book is how to define the real numbers axiomatically. How would that work? This book will read in this manner: we set down the properties which we think define the real numbers. We then prove from these properties - and these properties only - that the real numbers behave in the way which we have always imagined them to behave. We will then rework all our elementary theorems and facts we collected over our mathematical lives so that it all comes together, almost as if it always has been true before we analyzed it; that it was in fact rigorous all along - except that now we will know how it came to be. Do not believe that once you have completed this book, mathematics is over. In other fields of academic study, there are glimpses of a strange realm of mathematics increasingly brought to the forefront of standard thought. After understanding this book, mathematics will now seem as though it is incomplete and lacking in concepts that maybe you have wondered before. In this book, we will provide glimpses of something more to mathematics than the real numbers and real analysis. After all, the mathematics we talk about here always seems to only involve one variable in a sea of numbers and operations and comparisons. Note: A table of the math symbols used below and their definitions is available in the Appendix. A select list of chapters curated from other books are listed below. They should help develop your mathematical rigor that is a necessary mode of thought you will need in this book as well as in higher mathematics. This part of the book formalizes the various types of numbers we use in mathematics, up to the real numbers. This part focuses on the axiomatic properties (what we have defined to be true for the sake of analysis) of not just the numbers themselves but the arithmetic operations and the inequality comparators as well. This part of the book formalizes the definition and usage of graphs, functions, as well as trigonometry. The most curious aspect of this section is its usage of graphics as a method of proof for certain properties, such as trigonometry. These methods of proof are mostly frowned upon (due to the inaccuracy and lack of rigorous definition when it comes to graphical proofs), but they are essential to derive the trigonometric relationships, as the analytical definition of the trigonometric functions will make using trigonometry too difficult—especially if they are described early on. The theorems described on the Inverse Functions chapter requires knowledge of Derivatives. The following chapters will rigorously define the trigonometric functions. They should only be read after you have a good understanding of derivatives, integrals, and inverse functions. This part of the book formalizes sequences of numbers bound by arithmetic, set, or logical relationships. This part focuses on concepts such as mathematical induction and the properties associated with sets that are enumerable with natural numbers as well as a limit set of integers. This part of the book formalizes the concept of distance in mathematics, and provides an introduction to the analysis of metric space. This part of the book formalizes the concept of intervals in mathematics, and provides an introduction to topology. This part of the book formalizes the concept of limits and continuity and how they form a logical relationship between elementary and higher mathematics. This part focuses on the epsilon-delta definition, how proofs following epsilon-delta operate on, and the implications of limits. It also discusses other topics such as continuity, a special case of limits. This part of the book formalizes differentiation and how they are used to describe the nature of functions. This part focuses on proving how derivatives study the nature of change of a function and how derivatives can provide properties to functions. Neither constructions of the Riemann Integral or the Darboux Integral definition need epsilon-delta limits. This part of the book formalizes integration and how imagining what area means can yield many different forms of integration. This part focuses on proving how derivatives study the nature of change of a function and how derivatives can provide properties to functions. Darboux Integral – The method of integration this book defaults to. Riemann integration – The popular form of integration. Here, you will find a list of unsorted chapters. Some of them listed here are highly advanced topics, while others are tools to aid you on your mathematical journey. Since this is the last heading for the wikibook, the necessary book endings are also located here. This page was last edited on 25 September 2018, at 19:41.